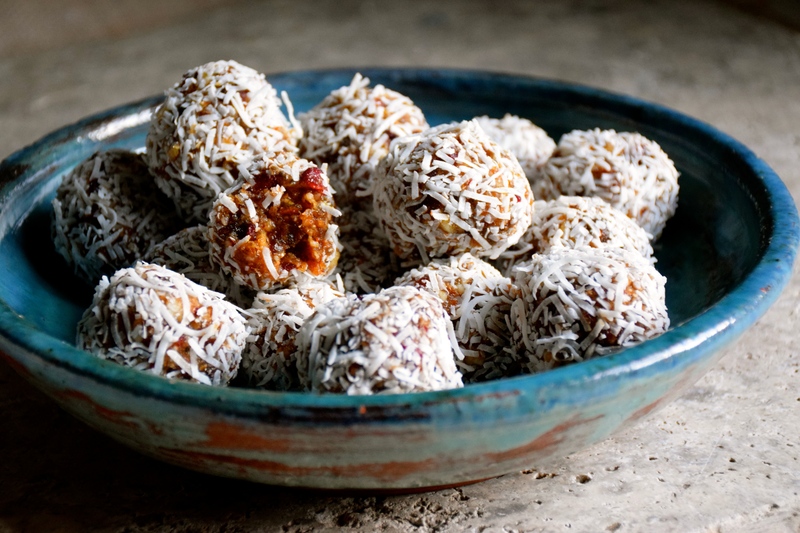 Truth be known – I adore Medjool dates, and think they are fabulous simply eaten as is. Their soft, sweet, distinct caramel flavour, can’t be beat. 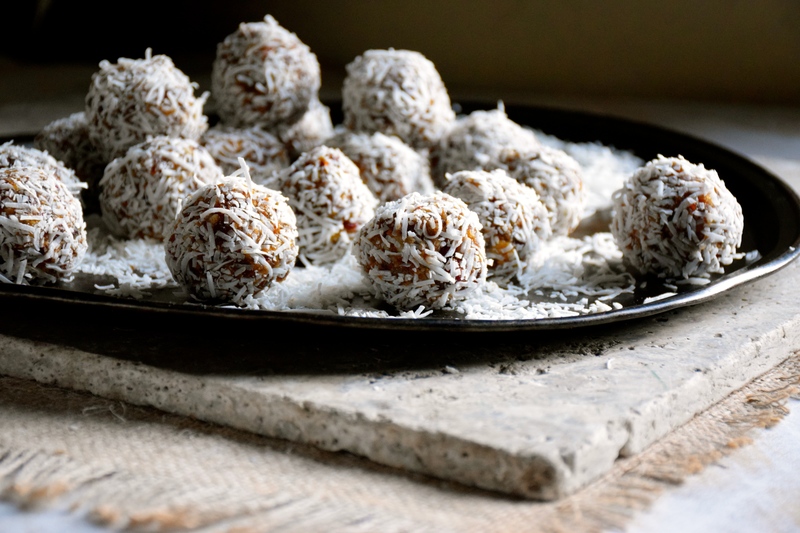 But you take that flavour and add it with other goodies like chia seeds, spices, coconut, and nuts and you get date balls. They are my latest obsession, and they might become yours too. As long as the Medjool dates you buy are fresh, these balls will last for up to a month in an airtight container in the fridge. That is if they aren’t eaten well before then. Place the chia seeds in a small bowl with 1/4 cup cold water. Whisk till combined and stand for 10 minutes. The chia seeds will swell up and turn to a gel consistency. Meanwhile, roast the macadamia nuts in a moderate oven (180C) for about 8 minutes. Set aside to cool. Once cooled, place in a food processor and blitz to a rough crumb. Set aside. Break open the dates and remove the pip. Roughly chop the dates and place in a food processor with the cranberries. Add the soaked chia seeds and cinnamon. Blitz the mix till the dates are well combined. In the final 30 seconds add the chopped macadamia nuts, the mix should come together in a ball. Divide the mix into about 20 balls, rolling them between your finger tips and the palm of your hand. Place them on a tray. On a second tray, lay the shredded coconut. 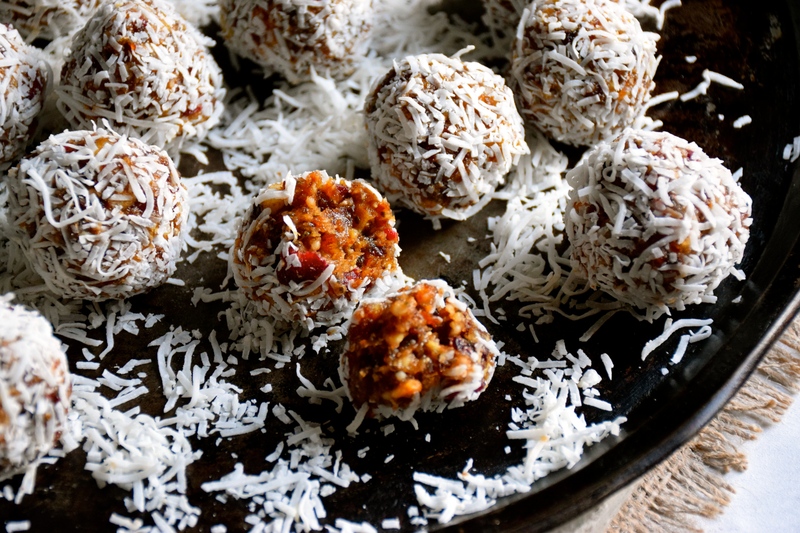 Roll each ball in the coconut till covered all over. Store them in an air tight container out of the fridge. Eat within one month. What fun! I need to make these for a plane ride later this week! Absolutely, you should. They are perfect snack food for traveling. Enjoy your trip. I love how food brings new ideas, new friends, great conversations and pretty much everything! Doesn’t it just. It’s the basis of life.